Can Adding Fluid In Tractor Tires Make The Bearings Fail? Today’s question is from Glenn in Florida. He wants to know about filling tractor tires with fluid. His local dealership salesman told him they didn’t recommend putting fluid in the tires because it would ruin the wheel bearings, and that wheel weights were a better choice. WHAT? What’s going on here? Now, Glenn had spoken to other dealers, and they said that using fluid is fine. Can You Actually Make the Bearings Fail? Well first off, let’s talk about ballast in the tires or anywhere on the tractor. Technically, any ballast you put on a tractor is going to cause a little bit of stress to the wheel bearings. But they’re designed for that: look in the owner’s manual. The manufacturer will tell you that you need proper ballast to keep the tractor stable in order to maximize your lift capacity. So yeah. It does add to bearing wear. But on most tractors, if you put the right amount of ballast you’ll never fail a wheel bearing. In fact, the only time I’ve ever known a ballast to fail a wheel bearing was when I worked at a dealership and we had one customer who loved ballast. He had some pretty steep hills that he was going on. He put fluid in his tires. He put weight on the wheels. And then he put weight every place he could hang it on the tractor. He did eventually fail a wheel bearing, so it can be done. However, if you’re just using a normal amount of weight you’re not going to fail a wheel bearing, so I wouldn’t even worry about it. In fact, I don’t understand why the dealer thinks wheel weights are gonna cause less stress on wheel bearings than fluid in the tires. In my mind, we’ve got a profit motive going here because the dealer can charge you for weights to put on the on the wheels. Tt’s going to be hard to charge you for water. Do You Live Where it Freezes In The Winter? Now Glenn is in Florida, so putting water in the tires is not a problem since it doesn’t freeze down there. But if you live in the Midwest or anywhere it freezes, if you put in straight water you could have big problems blowing up your tires. You need to add something. I personally hate that old calcium chloride we all used to use, because it’s caustic, but there are some antifreeze-type solutions that work okay. Believe it or not, the the best thing is beet pulp or beet juice. These are natural products that won’t harm animals and won’t hurt the environment. It’s my favorite, but it’s not available in all areas and it’s a little bit expensive. But it does way more than antifreeze, so you get more weight for your money in your tires. 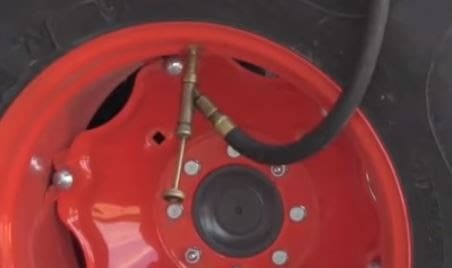 Keep in mind that if you live in the northern part of the US and buy a used tractor that comes from the south, make sure that any fluid in the tires in not straight water. They get by with it just fine down south, but in cold climates, that won’t work. To wrap it up: I think what we’ve got going here, Glenn, is a recommendation based on profit. They can’t charge you for water, and they can for wheel weights. Go ahead if you want, and put fluid in those tires and you’ll be fine. Don’t worry about it, but do be a little leery of this dealer from now on – I think he’s trying to get in your back pocket. ← What is the best brand of compact tractor?